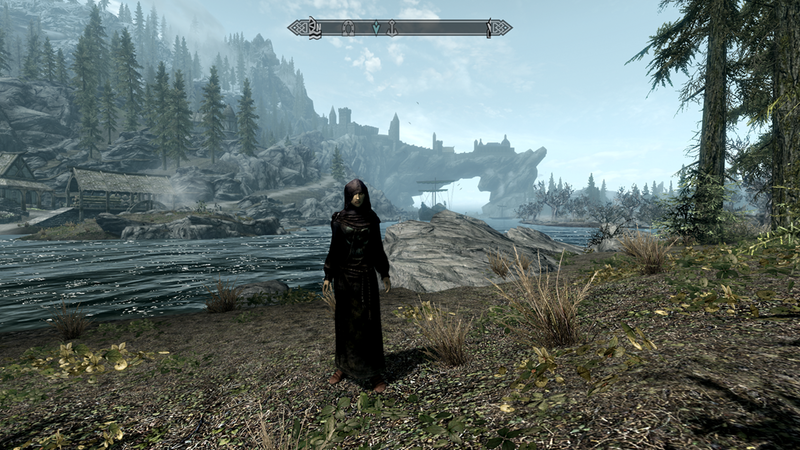 The walk to Dead Man’s Respite was surprisingly short from Solitude. It looked like it would take longer from the map. Lydia and I arrived well before sundown. 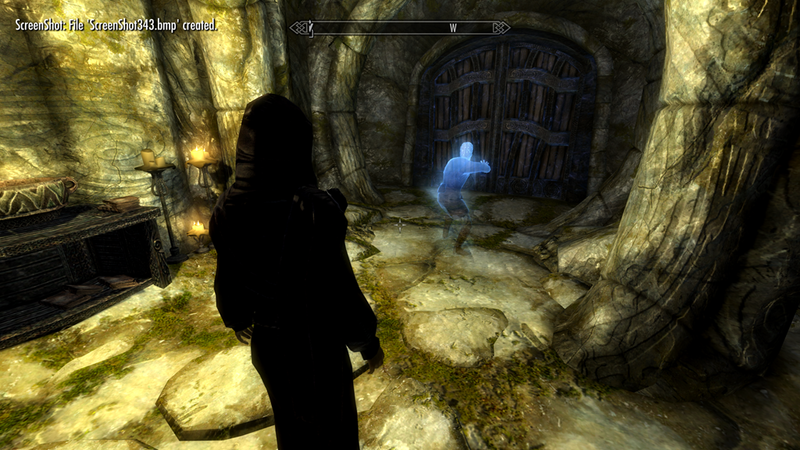 Stepping inside, we were greeted with a strange apparition that appeared to be playing a lute. 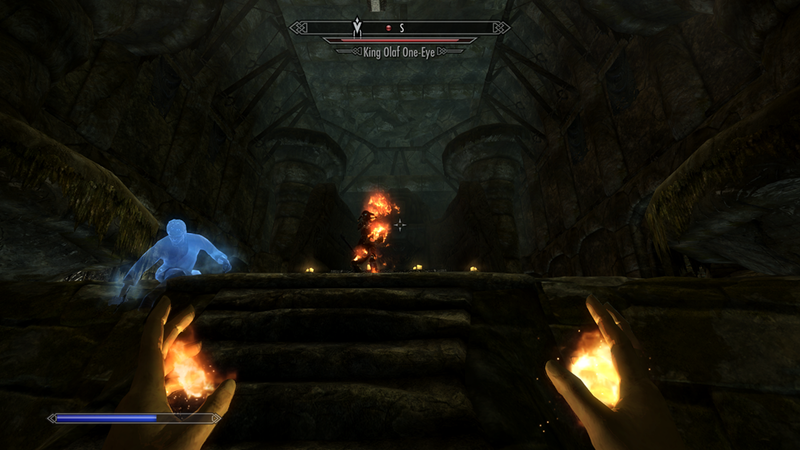 Curious to get a closer look at the ghost, I was taken by surprise by draugr. 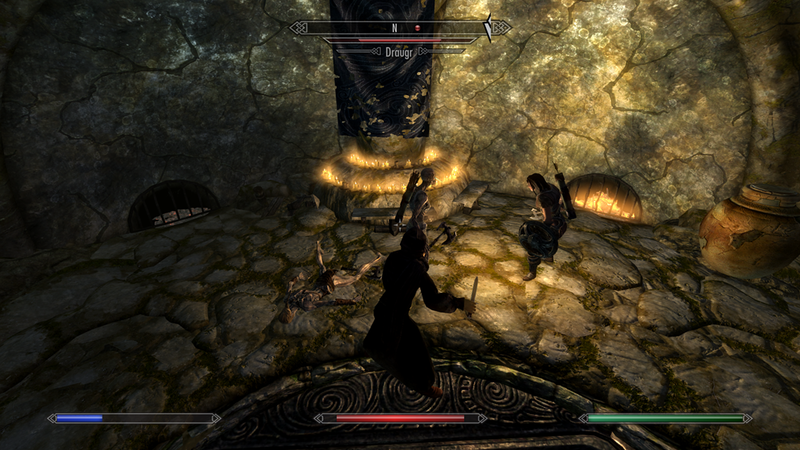 Lydia and I dispatched them, but perhaps not as cleanly as if I had my wits about me. I must take closer care in the future. More undead haunted the halls. Learning my lesson from earlier, I eliminated most of them before they had a chance to awaken from their unholy alcoves. If they lay inside of coffins, I cast a fire rune on them, which exploded on contact. 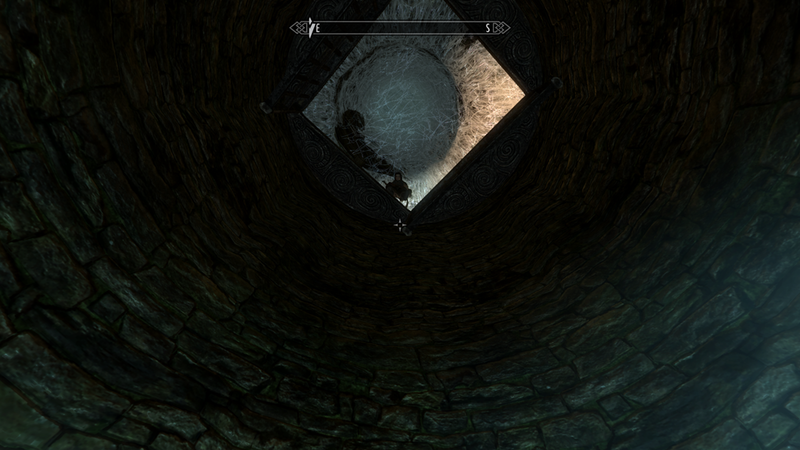 Sometimes the coffins were empty, but if they had a draugr waiting to ‘surprise’ me, they popped out in cinders. At one point, it seemed the only way to proceed was to jump down a pit. Would Lydia join me, I wondered? Despite my insistence that the drop was not that far, and the water really wasn’t that cold (I lied), she refused to jump. I sighed. I had no choice but to proceed on my own. I cursed her silently. I vowed to put this on her permanent record. 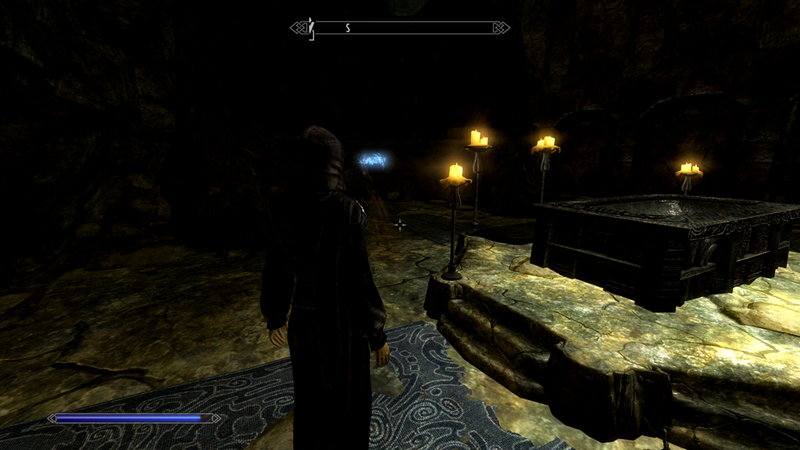 I entered a room of draugr, quite concerned. They burned easily enough, but I ran critically low on mana and potions. Since I jumped down a pit, I had no way to retreat. It looked hopeless. Lydia came through. Her fear of heights and jumping would not go in her permanent record. 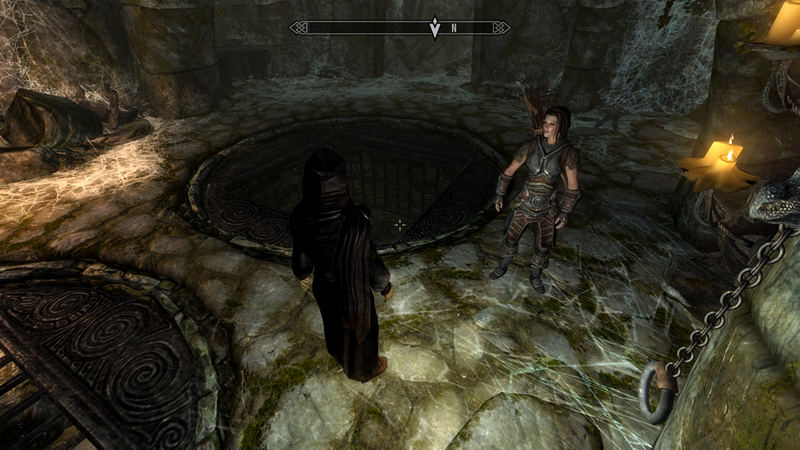 I agreed I would not mention this to the Jarl. I could certainly see the appeal of adventuring. Exciting action. Daring escapes. Defying death. Uncovering secrets. I learned to pick locks from the Khajit on the ship I stowed away on. They remarked that I had talent. Perhaps I did. I popped open this “Master” level chest only breaking three lockpicks. Perhaps I had been an adventurer in a past life. Whatever the case, ‘adventuring’ seemed to come easy to me. With a little help from Lydia. At the very bottom of the ruin, I found the ghost. And the notebook with King Olaf’s Verse. It was mostly illegible, but the poem was atrocious to begin with. Perhaps some things lost in time is for the best. I’m not sure I wanted to know how the original story ended. Well, every generation has a musician that was wildly popular for their time, only to later wonder why. Svaknir was possibly Tamriel’s first one hit wonder. With book in hand, we made our way to the surface. The ghost of Svaknir appeared and unlocked a door for me. Bad poet he may be, but very helpful. 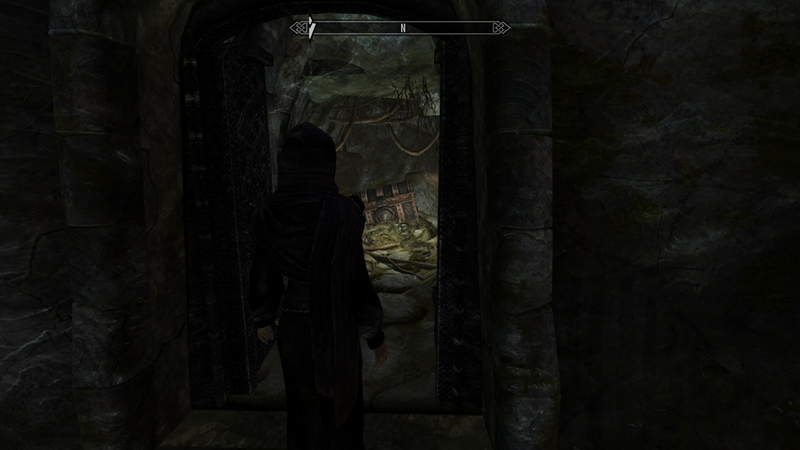 Behind the locked door, there was a Nordic puzzle door that required the ruby dragonclaw I found earlier in the dungeon. This led to some kind of council chamber. I saw all the seats were filled with corpses that looked just a little too ‘alive’. I tense. This could go very, very badly. No doubt something would trigger to waken, and I didn’t want them to pop up all at once. 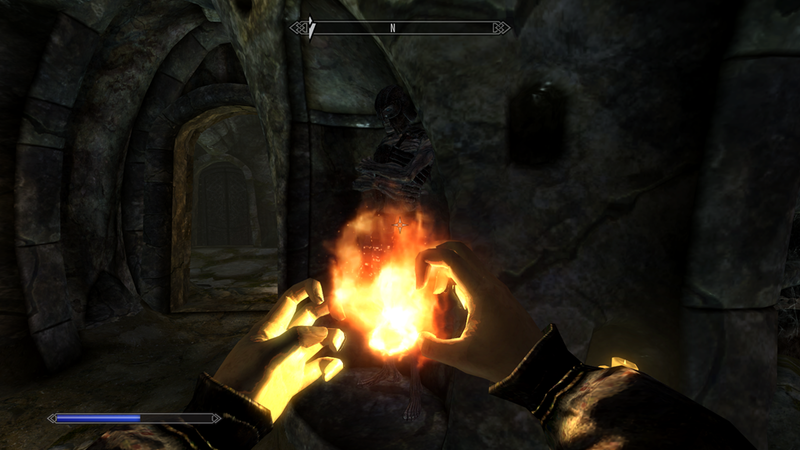 Conjuring a flame atronach for assistance, I eliminated them from their seats, one at a time. To my surprise, Svaknir’s ghost joined in the fray! 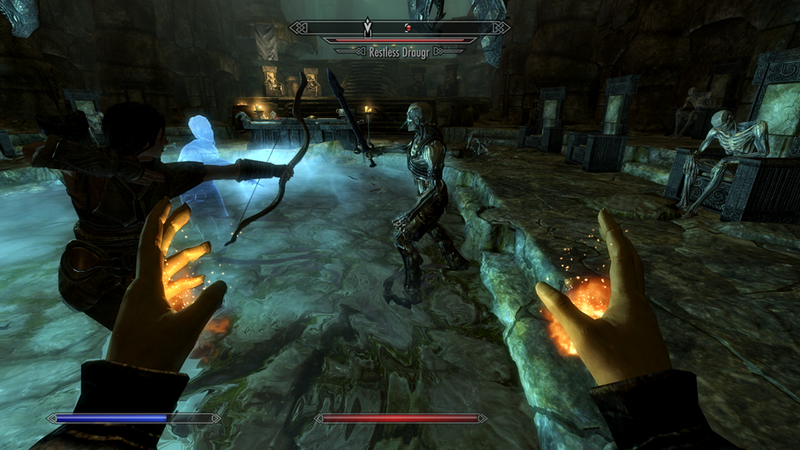 I just hoped he wouldn’t inadvertantly step on whatever trigger to waken all the draugr at once. We eliminated the ‘council’ smoothly. I was proud of the efficiency and team work. Well done, team. Walking up stairs to the throne, I saw what event would have triggered the ‘council’ to awaken. King Olaf. He was not at all pleased to see Svaknir. 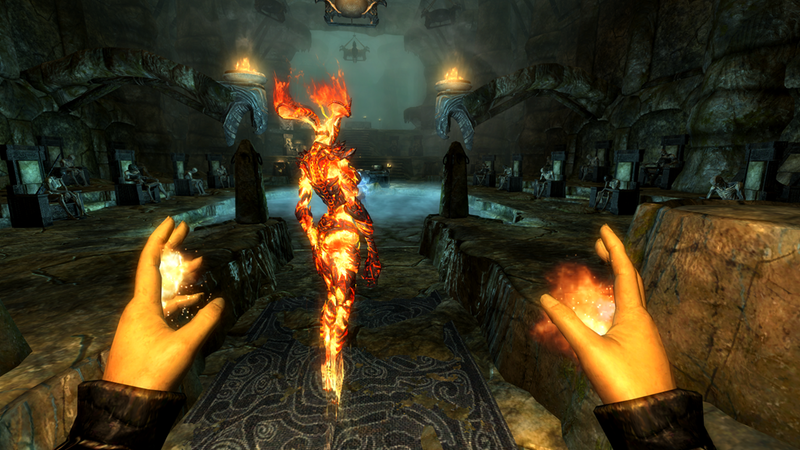 Lydia and Svaknir did a great job of keeping King Olaf’s attention on them, while I destroyed him with fire. Behind King Olaf’s coffin, I was summoned by another dragon chant. I obtained knowledge of “Whirlwind Sprint”, but I was unable to unlock it. I found myself eager to find another dragon. I wanted this power. 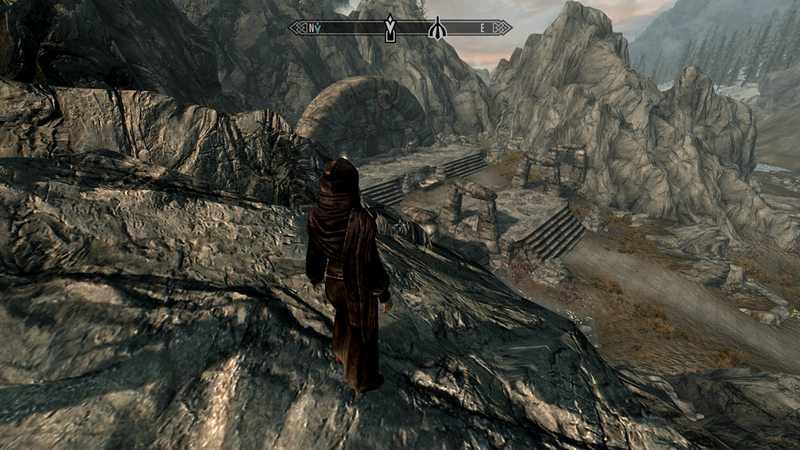 Returning to Solitude, we went by way of Dragonbridge, picking flowers and mushrooms as we walked. We stumbled upon a couple of saber cats, which was harrowing. One swipe of their paws would fell me for sure, and there were two. 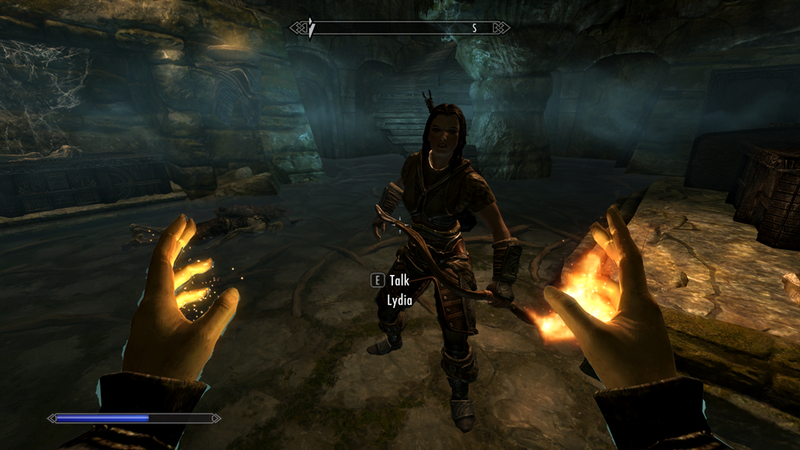 Lydia was able to survive their onslaught, though she didn’t do much to harm them. Fur burns very, very well, though. I plucked their eyes and pulled their teeth. Not just trophies, but useful ingredients. Eye of Sabre Cat could be used to make beneficial potions like restore health and stamina, or poisons to damage magicka and ravage health. Ravage health was a particularly nice poison, since it could lower the maximum health of powerful opponents. Sabre Cat Teeth didn’t make potions that were of particular use to me – Fortify Heavy Armor, Fortify Smithing, Restore Stamina, and Weakness to Poison – but the mixing would be valuable in terms of experience and coin. I returned the Verse to the Bard’s College, where Viarmo agreed the poetry was terrible. I convinced him to fill in the gaps in the incomplete verse. Why not? The job of Bards and storytellers is to ‘embellish’. I convinced him to dress up the verse with flourish. King Olaf was actually a dragon, and sacked Solitude in dragon form. He didn’t fight Numinex, he was Numinex. Viarmo was skeptical, but I assured him the audience would love it. 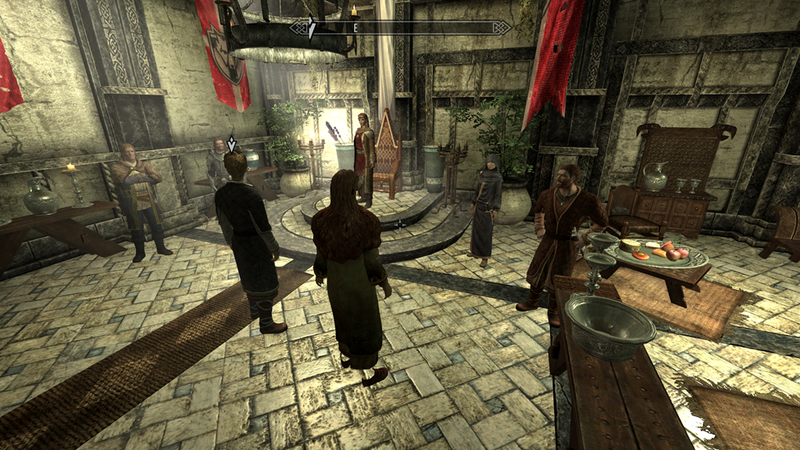 We presented it to the Jarl. For a moment, I did wonder if perhaps the ‘embellishments’ had gone too far. Fortunately, the Jarl Elisif loved it. She interpreted it as allegory. Fantastic. She agreed to allow the Festival to continue. The Festival started at sundown. Sorex Vinius from the Winking Skeever provided the food. He looked rather handsome in the moonlight, I thought. Viarmo lit the effigy of King Olaf. Having actually burned the real King Olaf’s lich form, I was not terribly impressed. But the citizens of Solitude seemed to enjoy it. 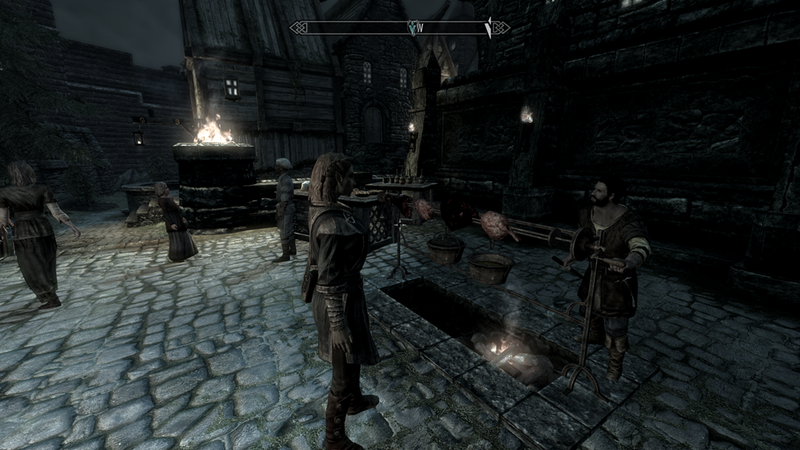 Emboldened with a few drinks of wine, I attempted to impress Sorex with tales of our battle with the real King Olaf. He seemed a little scared of me, and said he had to get back to the Inn. I sighed. I never really was very good at this flirting thing. Perhaps sharing tales of heroism only works on fair maidens if you are a dashing prince, like my brother. Obliterating lich kings and dragons as a not-so-damsel-in-distress did not seem to have the same appeal to innkeeper’s sons. Ah well. It would probably never have worked anyway. He was cute, but if I were to have a partner, I needed someone with more backbone. Someone I could travel with. I didn’t see Sorex as someone who would ever leave the confines of city walls. I rented a room at his father’s Inn, and bid him a friendly goodnight. 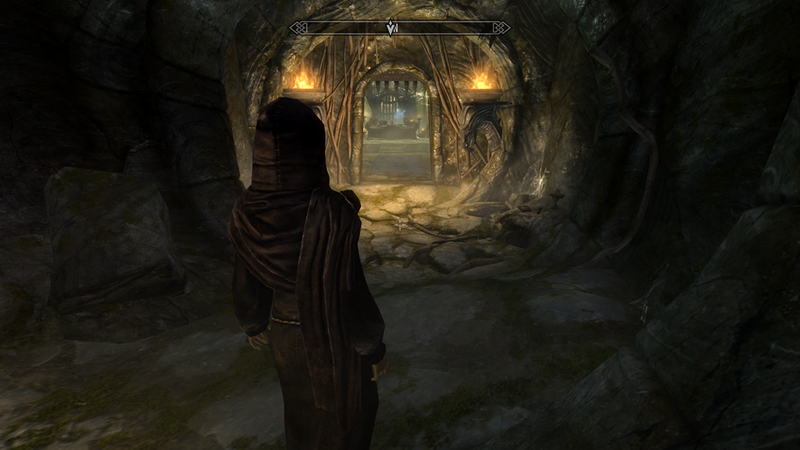 I hadn’t given much thought to marriage, but I wondered if there was someone in Skyrim for me. But if I got married first, then I couldn’t be forced to marry Verin.